Famous for sun and spas, this luxe Mexican hot spot is also full of natural wonders—and a Los Cabos honeymoon is totally on-trend. 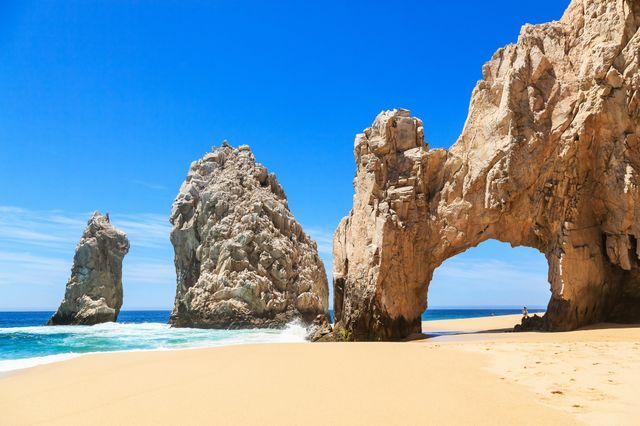 Los Cabos is the area stretching between Cabo San Lucas to the west and San Jose del Cabo to the east along the coast of Baja, California and Mexico. And we can tell you, a Los Cabos honeymoon has a little bit of everything on offer. At night, find yourselves taking shots of tequila and joining the dance party at the club. During the day, take in the white sand beaches, crystal blue waters, and stunning cliffs—not to mention the plentiful marine life on display. Here, in this luxe paradise, you will find everything from over-the-top resorts to cozy cottages, and winding horseback riding trails to ATV beach excursions. Known to attract celebrities, Los Cabos is often noted for its grand scenery and party-life (ever heard of Cabo Wabo? ), but you can find plenty of R&R for your Mexico honeymoon retreat, including secluded beaches, quaint art towns, pristine deserts, and the beautiful underwater coral reefs. Los Cabos is what you make of it—so take in a little of everything it has on offer during your Los Cabos honeymoon. The best weather can be found from October through May, but the best prices are from June to October, when tourist crowds die down a bit from the holiday rush. If you love whale watching, plan your Los Cabos honeymoon for December through March, when migratory families make their way to this coastline—but be prepared for high-season pricing at the resorts and restaurants. Canoodle at Lover’s Beach: What’s more fitting for your Mexico honeymoon than a strip of white sand beach amid wave-washed rocks? Pack a picnic. Tour the Baja Desert by ATV: Go offroading on the pristine Margaritas Beach, then take on the Baja California Desert, where you’ll see tons of cacti and maybe even some road runners. Explore the Sea of Cortez: Hop aboard one of the many tourist boats in the Cabo San Lucas Marina for a snorkeling adventure complete with a view of the famous Arch, sea turtles, and a dynamic ocean reef. Lunch is typically included. Enjoy a seafood dinner on the sand’s edge: At Las Ventanas hotel, the sea grill offers a stunning view of the Sea of Cortez, paired with fresh ceviche and traditional Meixcan dishes. Experience Cabo Wabo for yourself: Rock legends have performed here, so join the party crowd at this popular complex owned by Sammy Hagar during your Los Cabos honeymoon. Go whale watching: From early October to March, migratory gray whales swam the Baja Peninsula, and there are plenty of opportunities to hop on a boat and go tail spotting. Visit Hotel California in Todos Santos:: Yes, that Hotel California is only a short ride away from Cabo, and offers a respite with its sleepy-town vibe. Eat world-famous fish tacos: The original Baja fish taco was born in Los Cabos, and the best can be found at local taco shops like El Gran Pastor, Las Guacamayas, and Asi y Asado. Try them all during your Los Cabos honeymoon! Join the conga line at El Squid Roe: This popular party spot serves yard long beers glowing in neon colors and plenty of quirky characters for a night to remember (if you don’t drink too much! ).